Beginning an 8 hour session on this piece. I already know which direction and colors I will be going within this piece and what my intentions wish to manifest through the paint. It will be a good exercise to see if I can match what I am seeing in my mind and whether or not my hand can mimic it. It’s a simple geometry, one I’ve been playing with in my work for years, and today, I plan on using this exercise to gauge at what level of production I am running. It’s a reassessment as I begin a new session within my practice. Over the next few months I plan on evolving my work in multiple dimensions, and truly enter a stage of refinement and finality with many of my pieces. This piece is a part of Series 16, or the cluster of works I do as studies all within the framework of a 16″ x 16″ mandala. 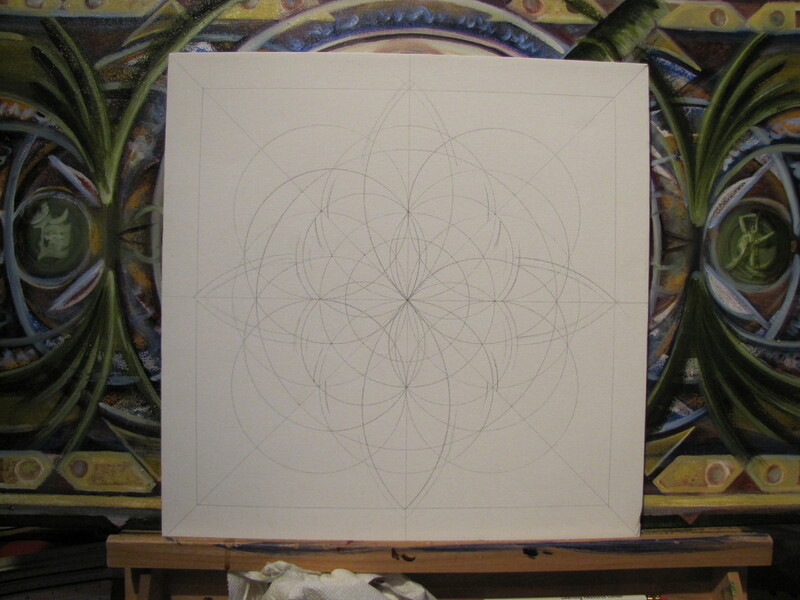 The will all follow the same super structure and process and it will be an open ended series of paintings. As an artist, when you have to step out of Artist mode and enter Admin or Business mode, it can sometimes be weeks before you return to the canvas. Anything longer than a week, for me, puts me in a place where my engine is very cold, and takes about a week of painting exercises to get back up to speed. When you are painting at full capacity of 40-50 hours per week, you really have to monitor and reassess your energy levels constantly. If not, you will quickly burn out, of which I have experienced many times. When that happens, it can take longer to get back on the canvas. Being a full time painter is not easy, it is down right exhausting sometimes, and you can never stop, like driving up a snowy road. You lose momentum, and you begin to slip and then gravity captures you pull you down. The thing about being an artist is that it puts you face to face with your real self. A long time ago, in the beginning, the world was black and white, or at least that is how I chose to explore it. I wasn’t quite ready to move into the realm of color, and my main interest and focus was studying the geometric patterns and relationships I was seeing expressed in my artwork. Color, in many ways, is a Universe unto itself, easy to get lost within and sometimes distracting. What I was looking for, I did not know, it was all new to me, and at the time, some 10 years ago, there was little precedence for understanding Mandalas, or at least information availability, so I basically had to move forward in trial and error mode. Through the Mandala, I felt I was exploring a new world, a new continent, a dimension or pathway through the Universe only a few humans have glimpsed. The idea is that between the Big Bang, or Singularity that created our Universe and the complexity found within the DNA molecule, there is an unfolding pattern or pathway that the Universe follows. An ever-evolving process that follows simple and basic rules. Tied to the four forces in the Universe, yet flowing, balanced within a chaotic equilibrium, this current exists that all natural things tend to follow. In my mind I was aligning myself with the Universe I found myself within. Sounds crazy, I know, but makes sense in a primal sort of way. Patterns themselves as building blocks. These pieces are the roads maps I made exploring the geometrical frontier. Mostly so I remember how to return to those places. It is from this context I began my artistic career, mostly as a curiosity and then ultimately as a means to live and align myself to. The practice had side effects like evolving me from a chaotically cluttered being into having a life that finally found a sense of peace within order. I am very meticulous with my practice and it is mainly because of the subject matter itself. Bringing order from chaos. These pieces all start the same way and follow the same set of ‘rules’ or ‘parameters’ in their growth process. It is a part of an exercise I developed into a process to strengthen my mental capacities and drawings skill-sets. Some of the benefits are aligning the two hemispheres of the mind so they work together and not against one another, increasing the neural pathways involved with hand eye coordination, understanding composition and relationships within a piece of work and have a coming effect on the mind. It is far better than any form of medication I have taken for proactively gaining control of one’s own faculties. I have kept these drawings mostly stored away due to a sense of incompletion, yet it is time to return to them. To come full circle and begin the practice again to finish these works. I hope you enjoy them. There is a great deal of healing energy in them from using them to align my mind with the universe that surrounds me. 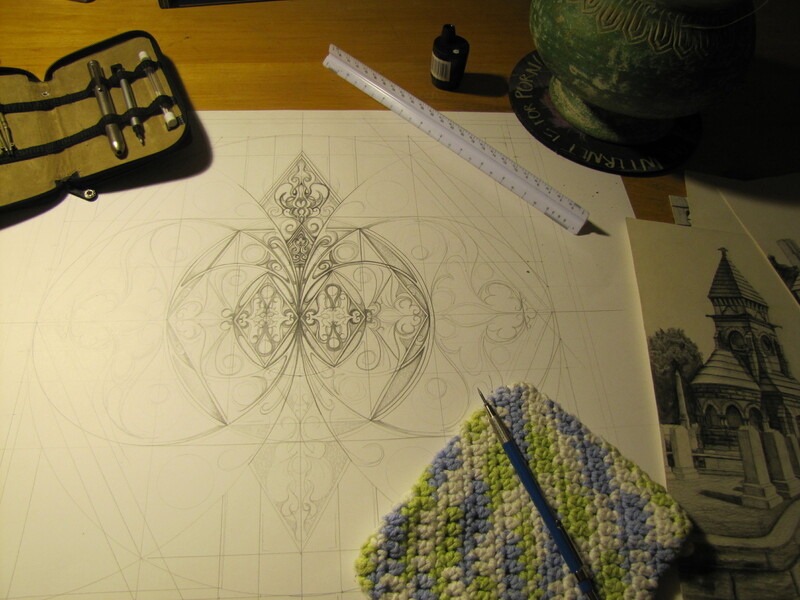 In January, I finally returned to my mandala practice. That is 15 minutes minimum in the morning to awaken and focus my mind, and 15 minutes minimum to settle it down and prepare it for rest. I have found over 10 years that it has become a valuable tool for helping me to keep my mind focused and thoughts organized. When I pull away from the practice, I have to find other ways to channel that stress through my work load. It has also become a wonderful ‘barometer’ for measuring those stress levels. On the creative side it keeps my drawings skills sharp and active and gives me a playground to explore new ideas forming in my imagination. These pieces are typically 18″ x 18″ and I have started roughly 64 of them over a 2 1/2 year period starting around 2002. I have finished about 10, and my hope is that this exercise of 30 minutes a day will expedite completing all of them. It becomes spiritually cumbersome carrying around incomplete works through your life. I am coming to the realization that I have many unfinished works that I need to get a move on. But traveling at the speed of light, it is much too easy to not realize how much matter you pick up along the way. I will be posting these as I do a preliminary rough scan of them to display here, and as they are completed, do a higher resolution scan. All of these pieces were begun before I moved to oil color.